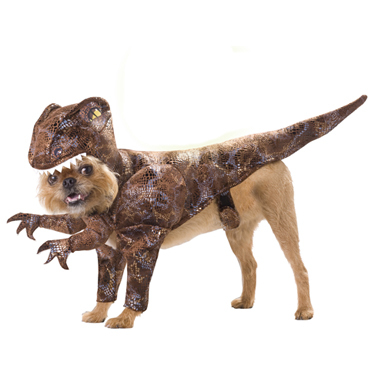 to go with them you can start your own Jurassic Dog Park. Just add yourself in khakis and a pith helmet to complete the effect. 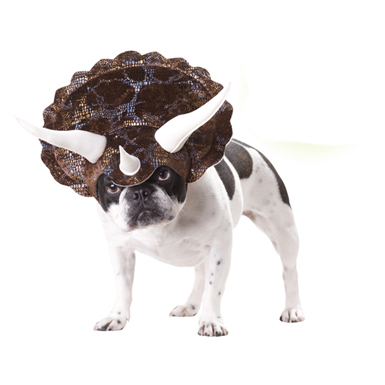 The triceratops is a favorite dinosaur of kids everywhere with the boney helmet head and the iconic three horns that give the beast its name. The costume is basically just a helmet, leaving the rest of the dog free to take care of any necessary dog business. For more information about this adorable costume or to order now, click here. Another popular dinosaur has a distinctive ridge of protective plates along its back and defensive spikes on the end of its tail. Despite the imposing appearance, the stegosaurus was a gentle vegetarian. The foam padding of the costume will help keep your pup warm on a chilly Halloween or that educational school pageant. 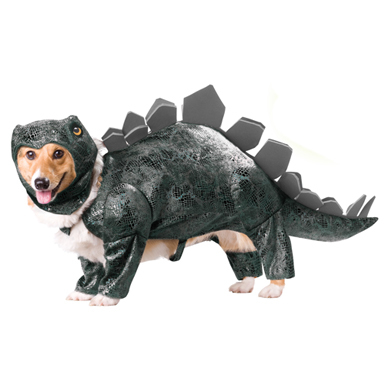 For more information or to order this fun canine costume, click here. One of the big dino-stars of the Jurassic Park movie franchise was the raptor -- a clever and terrifyingly efficient hunter. Dress your shy pipsqueak of a dog in this costume for a great boost of self-esteem (unless it is the sort that will die of embarrassment). Let them discover their alter-ego while celebrating one of the most popular holidays of the year. For more information and a chance to order, click here.